Now available from KRSS, a used fully refurbished and serviced AB-Sciex 6500 Triple Quad with Eskigent Nano LC / Nano 2D LC. To achieve the lowest limits in LC/MS/MS quantitation, you have to push the limits of technological advancement. The Triple Quad 6500 system does just that with significant enhancements in everything from ion production, to ion focusing and transmission, and through to detection. The results speak for themselves. 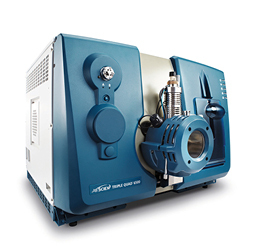 The SCIEX Triple Quad 6500 System with revolutionary, new, multi-component IonDrive Technology merges highly-evolved sensitivity with renowned performance. Adopting an intelligent approach to increasing the limits of quantitation, the patented IonDrive Technology introduces a series of advancements that increases the quantity of ions produced while enhancing the way ions are transmitted and detected. The results speak for themselves.